School summer holidays are always busy for the Company Section members of the Company who do not break for the summer, unlike the Junior and Anchor Sections and most other Companies, but they continue with their ‘Summer Events’ programme over the 6 weeks. This year, the events included a trip to a local zoo, a picnic with games, Lawn Green Bowls, Castle building on the beach and a treasure hunt on Barry Island. 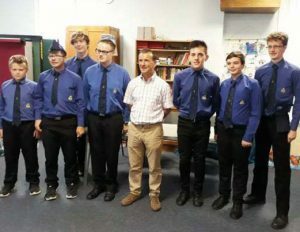 In addition to these events on Thursday 9th August the local MP and Secretary of State for Wales, the Rt Hon Alun Cairns MP gave a talk to the boys and Leaders on the workings of Parliament and his role as an MP and Cabinet Minister. This was followed by a question and answer session during which he answered some very probing questions. It is hoped to be able to follow this up with a trip to the Houses of Parliament early next year. Over the summer the Company also received a call for help from a concerned family which saw the boys and Leaders turning out one Saturday morning, well equipped with rake, hoe, shears and broom, to support a senior member of the local community to tidy up her garden which she has been unable to tend herself recently owing to an accident. Well done to Dylan, Luke, Andy and Roger on their efforts which will also count towards their voluntary service for their Queen’s Badge and Duke of Edinburgh’s Awards.